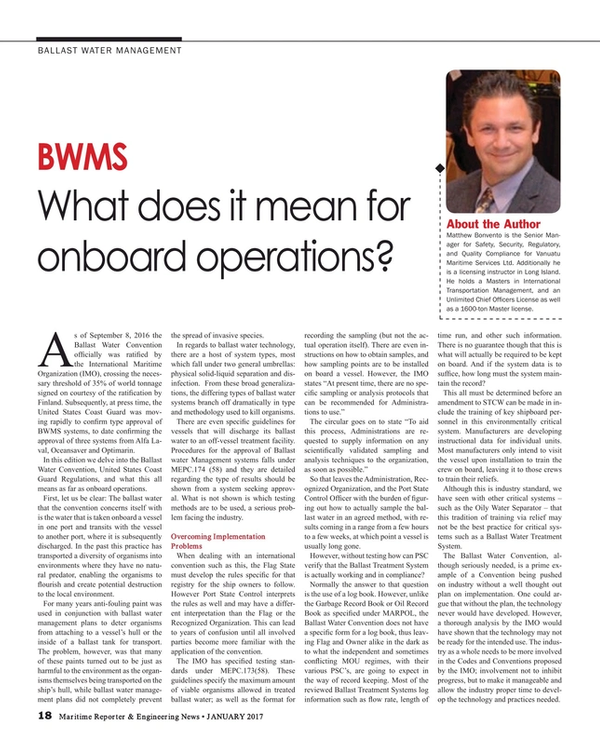 BWMS: What does it mean for onboard operations? As of September 8, 2016 the Ballast Water Convention officially was ratified by the International Maritime Organization (IMO), crossing the necessary threshold of 35% of world tonnage signed on courtesy of the ratification by Finland. Subsequently, at press time, the United States Coast Guard was moving rapidly to confirm type approval of BWMS systems, to date confirming the approval of three systems from Alfa Laval, Oceansaver and Optimarin. In this edition we delve into the Ballast Water Convention, United States Coast Guard Regulations, and what this all means as far as onboard operations. First, let us be clear: The ballast water that the convention concerns itself with is the water that is taken onboard a vessel in one port and transits with the vessel to another port, where it is subsequently discharged. In the past this practice has transported a diversity of organisms into environments where they have no natural predator, enabling the organisms to flourish and create potential destruction to the local environment. For many years anti-fouling paint was used in conjunction with ballast water management plans to deter organisms from attaching to a vessel’s hull or the inside of a ballast tank for transport. The problem, however, was that many of these paints turned out to be just as harmful to the environment as the organisms themselves being transported on the ship’s hull, while ballast water management plans did not completely prevent the spread of invasive species. In regards to ballast water technology, there are a host of system types, most which fall under two general umbrellas: physical solid-liquid separation and disinfection. From these broad generalizations, the differing types of ballast water systems branch off dramatically in type and methodology used to kill organisms. There are even specific guidelines for vessels that will discharge its ballast water to an off-vessel treatment facility. Procedures for the approval of Ballast water Management systems falls under MEPC.174 (58) and they are detailed regarding the type of results should be shown from a system seeking approval. What is not shown is which testing methods are to be used, a serious problem facing the industry. When dealing with an international convention such as this, the Flag State must develop the rules specific for that registry for the ship owners to follow. However Port State Control interprets the rules as well and may have a different interpretation than the Flag or the Recognized Organization. This can lead to years of confusion until all involved parties become more familiar with the application of the convention. So that leaves the Administration, Recognized Organization, and the Port State Control Officer with the burden of figuring out how to actually sample the ballast water in an agreed method, with results coming in a range from a few hours to a few weeks, at which point a vessel is usually long gone. However, without testing how can PSC verify that the Ballast Treatment System is actually working and in compliance? Normally the answer to that question is the use of a log book. However, unlike the Garbage Record Book or Oil Record Book as specified under MARPOL, the Ballast Water Convention does not have a specific form for a log book, thus leaving Flag and Owner alike in the dark as to what the independent and sometimes conflicting MOU regimes, with their various PSC’s, are going to expect in the way of record keeping. Most of the reviewed Ballast Treatment Systems log information such as flow rate, length of time run, and other such information. There is no guarantee though that this is what will actually be required to be kept on board. And if the system data is to suffice, how long must the system maintain the record? This all must be determined before an amendment to STCW can be made in include the training of key shipboard personnel in this environmentally critical system. Manufacturers are developing instructional data for individual units. Most manufacturers only intend to visit the vessel upon installation to train the crew on board, leaving it to those crews to train their reliefs. Although this is industry standard, we have seen with other critical systems – such as the Oily Water Separator – that this tradition of training via relief may not be the best practice for critical systems such as a Ballast Water Treatment System. The Ballast Water Convention, although seriously needed, is a prime example of a Convention being pushed on industry without a well thought out plan on implementation. One could argue that without the plan, the technology never would have developed. However, a thorough analysis by the IMO would have shown that the technology may not be ready for the intended use. The industry as a whole needs to be more involved in the Codes and Conventions proposed by the IMO; involvement not to inhibit progress, but to make it manageable and allow the industry proper time to develop the technology and practices needed. Matthew Bonvento is the Senior Manager for Safety, Security, Regulatory, and Quality Compliance for Vanuatu Maritime Services Ltd. Additionally he is a licensing instructor in Long Island. He holds a Masters in International Transportation Management, and an Unlimited Chief Officers License as well as a 1600-ton Master license.